You will receive 1 Pair(2 Bulbs). 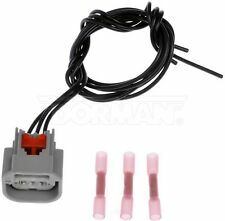 "Standard Turn Signal Switch --STANDARD TURN SIGNAL SWITCH. Condition : New. Designed for strength using high-quality materials to match the needs of service professionals ". Therefore all implied warranties that may apply to your part are limited to the duration of this written warranty. 3157, 3156, 3057, 3357, 3457, 4157, 4144. LED Type : 60 LED 3528 SMD (30 Amber / 30 White). Application : Front Turn Signal Light. Don't put standard bulbs into CK type sockets. It may pop the fuse or blow the bulb. 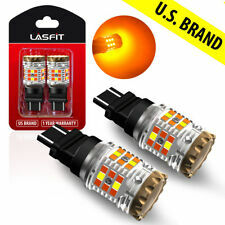 60 LED 1157 2507 Dual Color Switchback Turn Signal Light Bulb Resistor No Error. 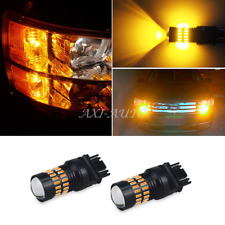 2 7443 7440 Amber White Led Bulbs Front Turn Signal Light Dual Color Switchback. 3157;P27W/7W;3156;3057;4157;3357;3457;3757;4114. Part #: CH2550132, CH2551132. 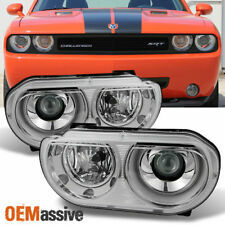 New 2015-2016 Dodge Challenger Pair OF Side Front Signal Marker Light LH and RH Side (NSF Certified). DODGE CHALLENGER 2015-2016. The NSF insignia confirms that it is a quality part and provides proof positive that the part will fit, perform, last and be as safe as the part it replaces. Model: DODGE CHALLENGER. Part: FRONT LAMP. DODGE AVENGER 08-09 Fog-Driving, (bumper mounted). DODGE CALIBER 07 Fog-Driving. DODGE CALIBER 08-09 Fog-Driving, exc. DODGE CARAVAN 05-09 Fog-Driving, (lower bumper cover). P27W/7W;3156;3157;3057;4157;3357;3457;3757;4114. 2pcs Load Resistors. Application: Front Turn Signal Light. If the LED Bulb hyper flash, wire a 6 ohm load resistor between Turn Signal Positive and Ground Negative. 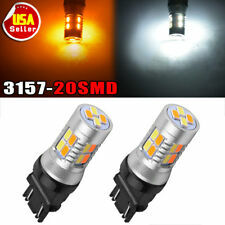 Amber/White 3157 3757 Switchback LED High Power Turn Signal Light Bulb Resistor. Don't put standard bulbs into CK type sockets. It may pop the fuse or blow the bulb. Or the bulb will light up amber ONLY. 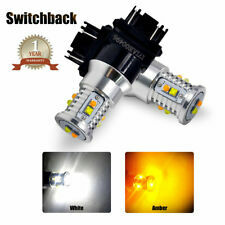 Switchback 3157 3357 3457 Amber/White 22 LED High Power Turn Signal Light Bulb. 2 x Load Resistors. Color: White / Amber(3 Amber / 3 White). If the LED Bulb hyper flash, wire a 6 ohm load resistor between Turn Signal Positive and Ground Negative. Dual Color: Different from before our sale item, now all of Cree 6 30W LED Cree 4 chip bright in Amber when turn signal, When back to Parking / DRL, also 2 Chip Bright in White. 2pcs LED Parking Liight 1156 1157 Cree High Power 60W in total Super White. Item Specifications: OEM Style Front Side Markers. Brand New, Never Been Used Comes with 2pcs. (Left and Right) Easy to Install. Replacement Front Fender Side Markers. 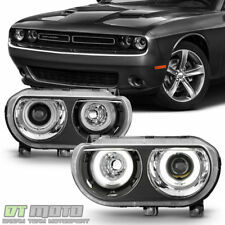 Item Fitment: 2008-2010 Dodge Challenger ***Installation Instructions are NOT Included. Professional Installation Highly Recommended.***. 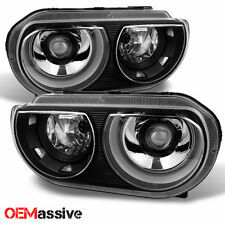 New, Never Installed Fog Light By Depo. Model: DODGE CHALLENGER. CHRYSLER 200 17 Fog-Driving, (bumper mounted). JEEP GRAND CHEROKEE 14-15 Fog-Driving, (bumper mounted), Laredo (VIN A, 7th digit). JEEP GRAND CHEROKEE 14-15 Fog-Driving, (bumper mounted), Limited (VIN B, 7th digit). 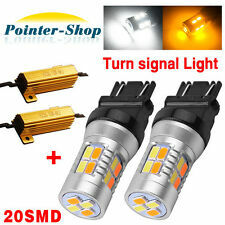 Solution for fast turn signal blinking response after installing SMD LED light bulb. Application: Front Turn Signal Light. "Amber-Off-Amber-Off" when Turn Signal on. If the LED Bulb hyper flash, wire a 6 ohm load resistor between Turn Signal Positive and Ground Negative. Interchange part number: 7443;W21/5W;7515;T20;W21W;7505;7440;7444NA. 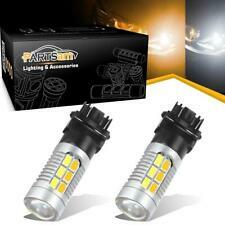 2pcs 3157 4057 White Amber Front Turn Signal Light Projector Led Switchback 4157. 1157 Switchback Led Amber/White High Power Led 22-5730-SMD Resistors x2. 3157;P27W/7W;3156;3057;4157;3357;3457;3757;4114. 7443 7444NA Switchback Front Turn Signal Light Amber 400lm,White 600lm Led x2. 2pcs LED Parking Liight 1156 1157 Cree High Power 60W in total Super White. For 72-74 Challenger. MOPAR DODGE. Possible Usage car/models; Mopar Dodge Plymouth Chrysler Challenger Cuda Barracuda R/T AAR T/A Rally 318 340 360 383 400 440 hemi 1970 1971 1972 1973 1974 1975 1976 yada-yada. Model: DODGE CHALLENGER. DODGE AVENGER 10 Fog-Driving, (bumper mounted). DODGE CALIBER 10-12 Fog-Driving. DODGE NITRO 10-11 Fog-Driving. Side: Left. Left Hand side, also known as the driver's side. Part Grade Abbreviations. NOS MoPar #2930781 fender turn signal indicator lamp for various 1969, 1970, 1971, and 1972 Plymouth and Dodge, Dodge Truck models. 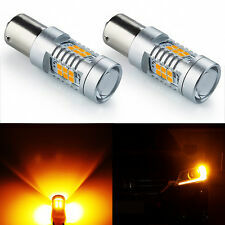 2pcs 7443 7440 White LED Backup Reverse Light 60-3528-SMD High Bright Bulbs. If the LED Bulb hyper flash, wire a 6 ohm load resistor between Turn Signal Positive and Ground Negative. "Amber-Off-Amber-Off" when Turn Signal on. CARAVAN 05-09 Fog-Driving; (lower bumper cover). PACIFICA 06-08 Fog-Driving; (bumper). AVENGER 08-09 Fog-Driving; (bumper mounted). TOWN & COUNTRY 05-09 Fog-Driving; (lower bumper cover). SEBRING 07-09 Fog-Driving; (bumper).